For most people who live in the city space is an issue. By the time you add a deck, patio, shed, and perhaps a play structure there is not alot of room left for trees. A yard without trees though has no shade and no privacy. For this reason trees that are narrow, or mature with a small crown have become a very popular gardening trend in Winnipeg. The following is a list of trees that are suitable for small spaces. Amur Maple - One of the hardiest maples matures at 20 high with a spread of 20 feet wide. It is known for brilliant red and orange fall colors. Ohio Buckeye - Palm shaped dark green leaves turn a copper bronze in the fall. It has a rounded growth shape and matures about a 35' feet high and wide. Lorbergii Caragana - A delicate ferny speciman tree that will only grow up to 15' high. It has a upright spreading growth and will grow up to 10' wide. It is known for smooth olive bark, and a beautiful yellow fall color. Snowbird Hawthorne - A very hardy hawthorne that is known for stunning clusters of white flowers mid spring. It grows in a rounded shape and matures at about 20 feet high and 15' wide. Russian Olive - An excellent tree for contrast due to the siver foliage all season long. It also features scented yellow flowers and small silver berries. With upright somewhat rounded form maturing at 25' high and 20' it is a beautiful addition to any landscape. 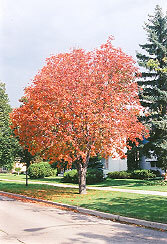 Prairie Spire Green Ash - A tight narrow but tall tree is a low maitenance fast growing screen for a small yard. It will grow 25' wide and 50' high at maturaty. It is a seedless variety of the green as that is known for it's brilliant gold fall color. Big River Flowering Crab - This newer crab variety will be covered in a profusion of red and pink flowers in the spring. It has a upright spreading growth habit, maturing at 20' high and 15' wide. Fushia Girl Flowering Crab - This is an improved version of the old favorite "Royalty Rosybloom". It also matures at 20' high and 15' wide and has a deep purple foliage that turns red in the fall. It will be covered in fuchsia- red flowers in the spring. Courageous Flowering Crab - a new introduction that is seedless and features pink flowers in the spring. More information on this tree coming soon. Pink Spires Flowering Crab - With a mature height of only 15' and width of 12' this is the smallest rosybloom currently available. It has showy pink flowers and brilliant red fruit in the fall. It is known for it's refined pyramidal form and changing foliage colors. Goldrush Amur Cherry - Known for its showy bronze bark and fragrant white flowers in the spring. The goldrush will mature at about 35' high and 30' wide. Showy Mountain Ash - With a dense oval form, showy white flowers, and brilliant fall color this will add beauty to any small yard. Matures at 20' high and 15' wide will clusters of red berries in the fall. Black Hawk Mountain Ash - A larger mountain ash maturing at 30' high and 20' wide. It has white flowers followed by orange berries, and a brilliant fall color. 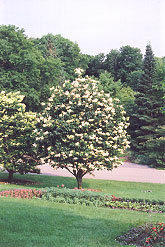 Japanese Tree Lilac - In late spring beautiful frothy white blooms cover this upright spreading tree. It will mature at 25' high and 20' wide growing in a very neat upright habit. Dakota Pinacle White Birch - A great new introduction that is extremely hardy and only gorws 10' wide. It matures at 35' high making it an ideal screen for a small yard. A great replacement for the Swedish Aspen.